You found a bug in Makinom? Please give me some details on the node's settings. 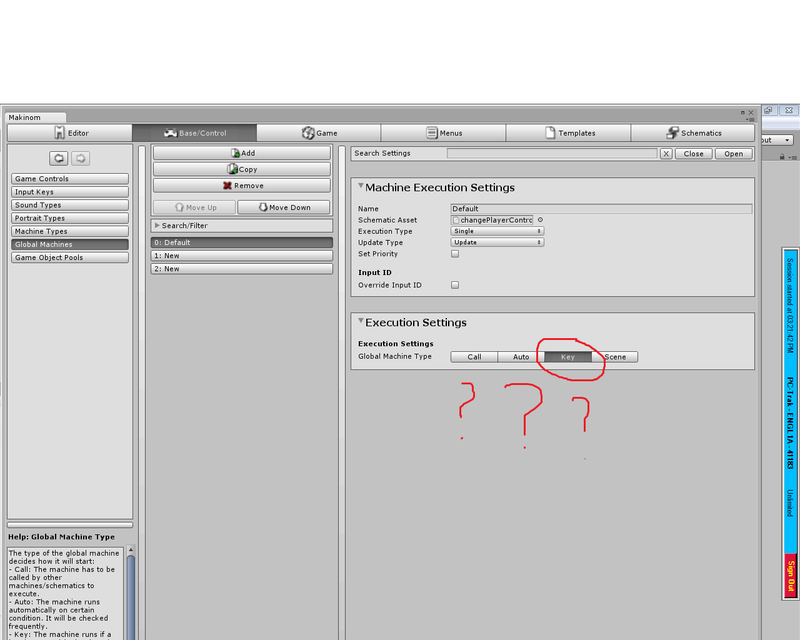 After open "GUI Boxes" by "open in GUI Editor" , when edit the position of element will auto add some "Name Box"
Well, after upgrading to the offical one, I noticed a bug. In Makinom--> Global Machine, when trying to put the type to KEY, nothing shows up, so you can't really assign a key to it. I'm sure that something was here before, because I think I already assigned a key to that global Machine way last time, but now it just disappeared. I checked the Ork global machine, and it gives you the option to assign a key to it when you set the type to KEY. Is this a bug? Or was I just sleep makinoming that time and saw things not there? In the HUD, trying to open the GUI Editor doesn't work. In the "Change Variables"-Node for the String type variables, the operators "Replace" and "Replace All" seem to do the same (they both replace all occurences). As far as I can tell, the schematic worked fine in the scene, (in the title screen) but once I started a new game and left the scene while the schematic was in process, this popped up. The schematic is created to loop over and over again until you leave the title screen, if that makes a difference. A stack overflow is usually coming from doing too much stuff in a single frame. How are you repeating the schematic? E.g. if it's just a loop without any kind of wait, that's only logical to happen. There's a security option in the Settings of schematics, to Limit Nodes per Tick to prevent stack overflows. I'd need to see the schematic/setup to tell you more. 1) Create a trigger to activate a Schematic. Use the player to activate it. 2) Create 2 Cubes nearby. 4) Found Objects Count will return Success regardless of the Filter settings (only tested with Object Checks and Distance Checks). So the filter doesn't seem to be working. 5) Disabling a single Cube will return Failed, indicating that Found Object Count is working correctly and can tell the difference between Found Objects=1 and Found Objects=2.